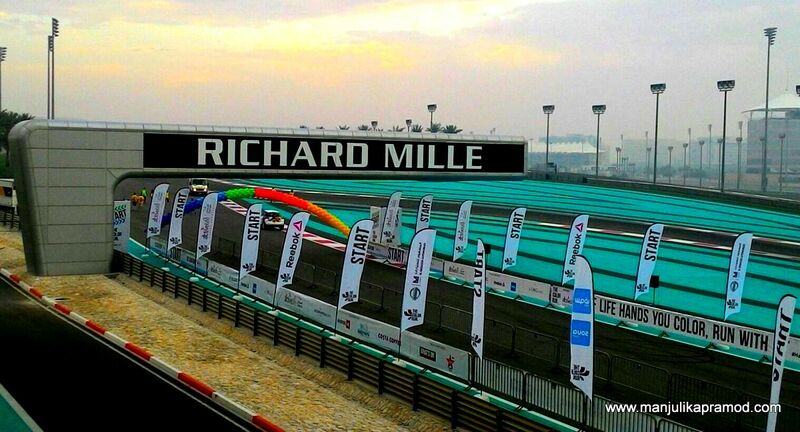 Hubby was at Yas Marina Circuit yesterday and I am proud that he did some live reporting for me. He was really quick in sending me some very interesting pictures. When we had a detailed word about it, he said it was a fun day and he had a great time. 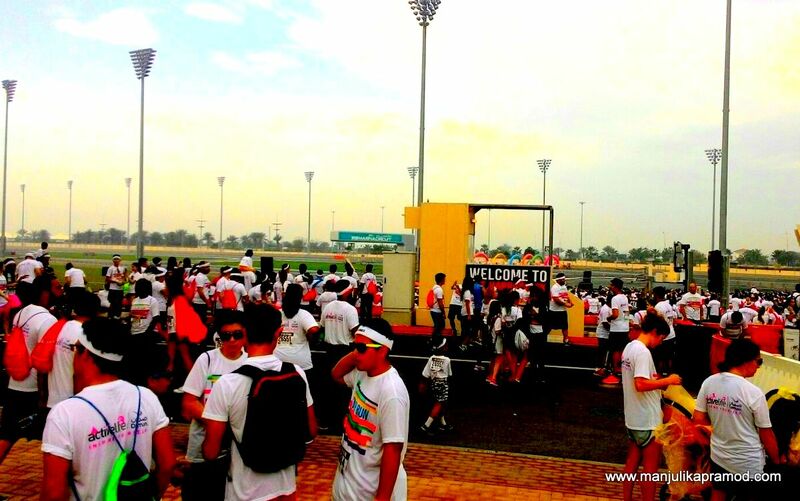 In a nutshell, ‘Colour Run’ is about a colorful day. Without getting into the complexities as to why and who is behind the concept, I would just say this is quite an interesting idea. As the name suggests, it is actually a run through a blaze of colors. 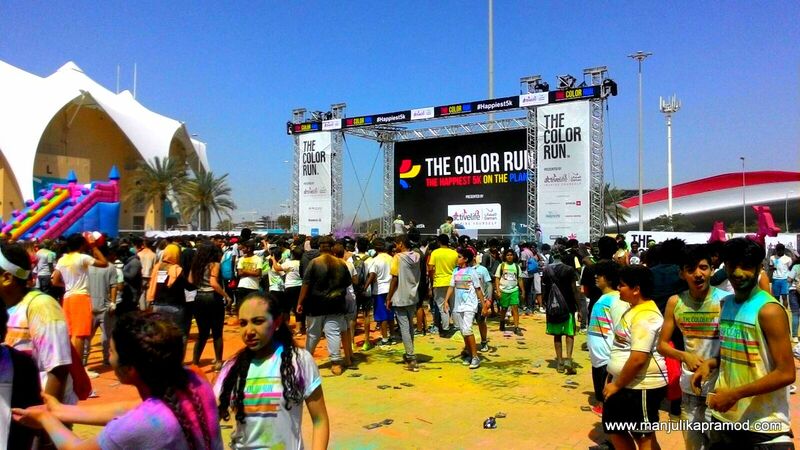 People of all age, shape and sizes make a healthy attempt to complete 5 kilometers while being splashed with dry colors at their faces and bodies. And I hear there are lovely treats at the end of the race. Then, why not? If people are fine with paying for such events and getting inspired to live happy and healthy, I think its a great idea. Lets have more of these runs! 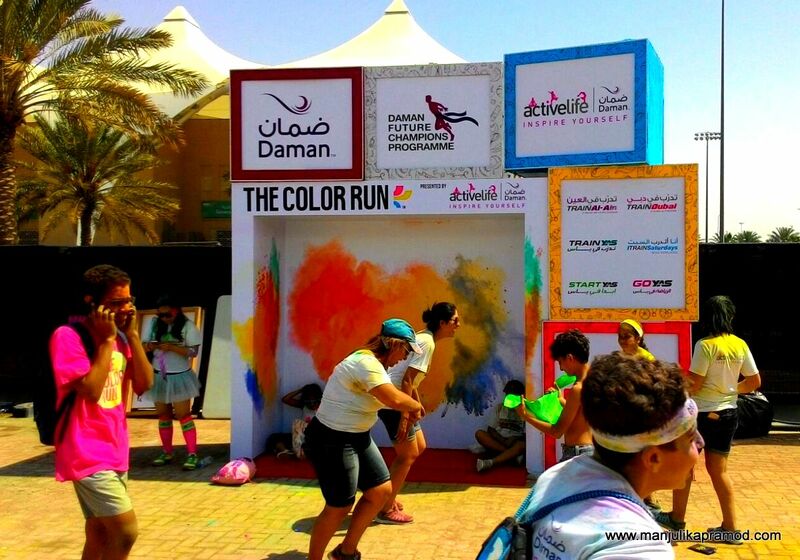 Daman’s Active life definitely deserves a mention here because they are main organizers of Color Run™ Dubai and Abu Dhabi. 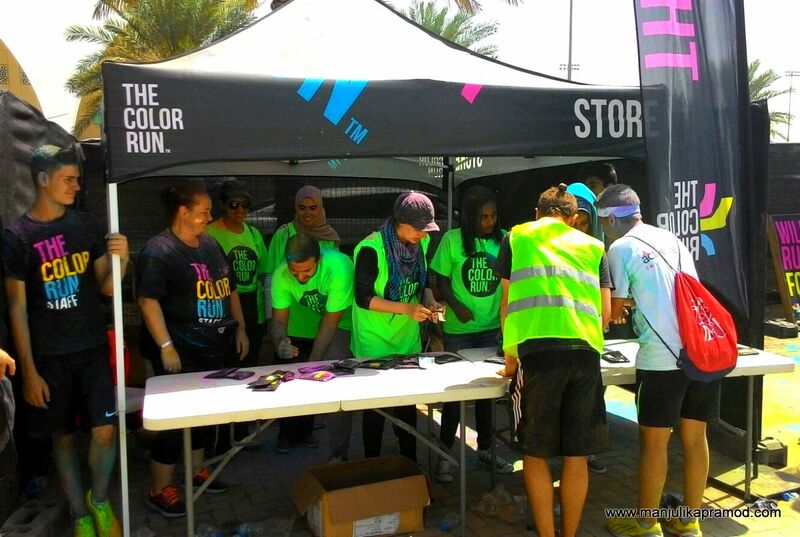 The Color Run- collecting badges! Happiest5k hashtag looks uber cool and its addictive too. Who doesn’t love to be happy? Well, ever since we are born we are on a lookout for happiness. Its just that with so many gory things happening around the world, and stress and misery bogging us down each day, we are losing its essence. These events are a great way to connect with friends and family and run together. I chose to write about this Happiest 5k run because I loved the concept behind it. I feel its very important to keep doing things that make us happy. And the best that I can say to inspire is that if you have ever been fascinated by the Indian festival-Holi, I am sure you can go ahead and be a part of Colour Run. To me, it looks like fun day to keep the worries off and just run for your healthy life amidst flying colors. You never know you may fall in love with running henceforth. When I read about it, I learnt that this run is not a non-profit making idea. But yes, it is meant for a good cause and thus is promoted and partnered by charity organizations and big brands in the cities that it takes place. 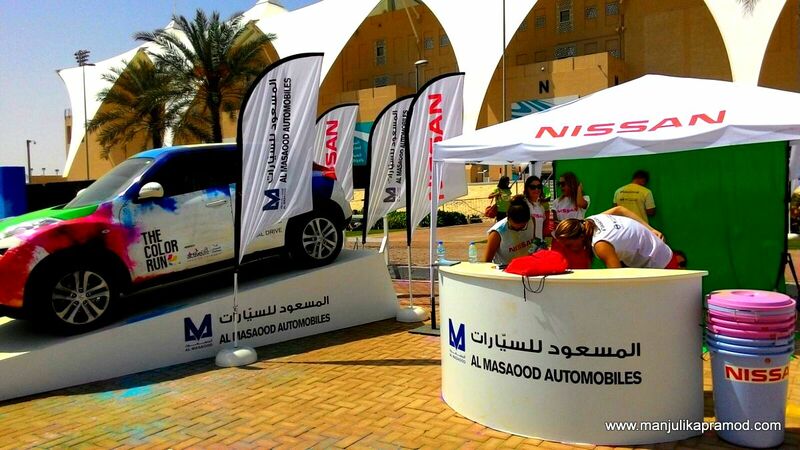 The sponsoring brands participate with full zeal. 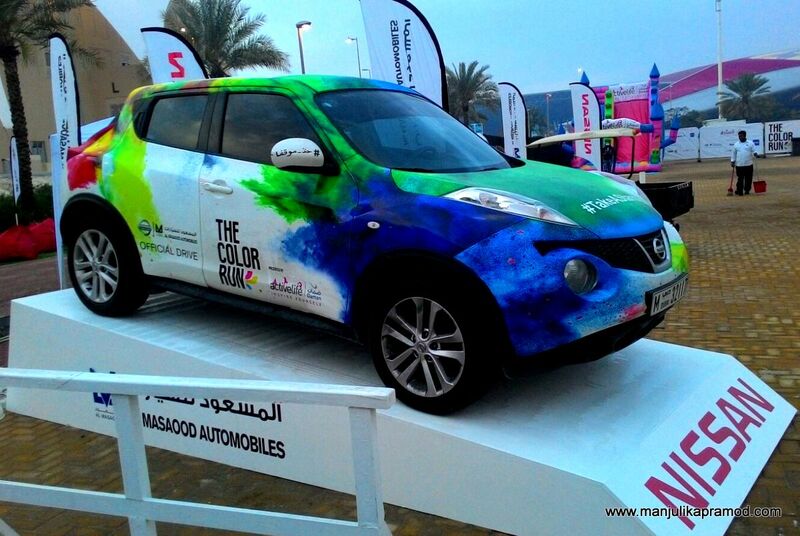 I am sure you noticed the colorful Nissan Car. I would love to own this rainbow car. Everyone in the family will have their favorite color on the car. Another set up which I really loved is below in the picture. 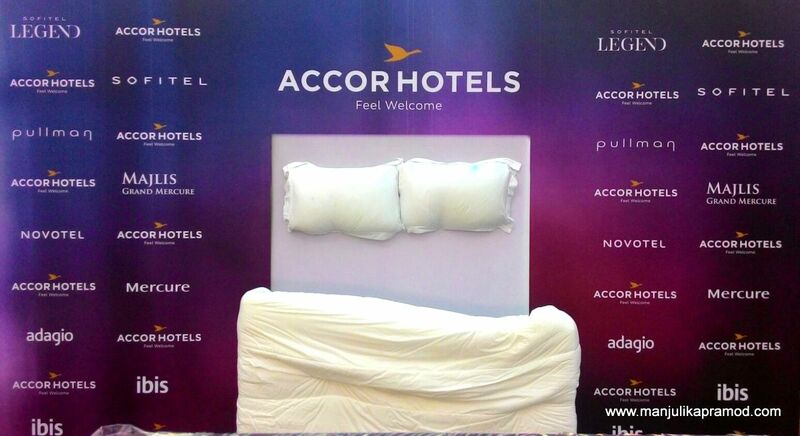 Accor Hotels were amazingly creative. 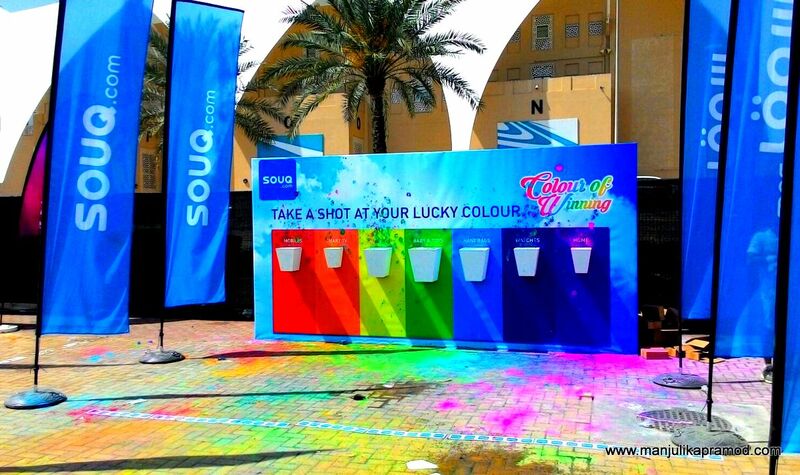 I am not saying this just because it was done by my friends from And Events but because I have loved this idea ever since I saw this setup in Colour Run Dubai. Thats’ Hubby at the Colour Run! Not sure how he managed a neat and clean click. I am not sure when is THE COLOUR RUN planning to come to India but whenever it happens in your country, don’t forget to send me a picture. I would love to add to the collection above. Ha Ha something similar to our Holi, a different avatar may be. Let’s hope it comes to India soon. Fun pictures! Glad you got these shots. Bangalore had one similar one a couple of years back and I had heard people absolutely loved it! These pictures looks like a lot of fun, Manjulika! 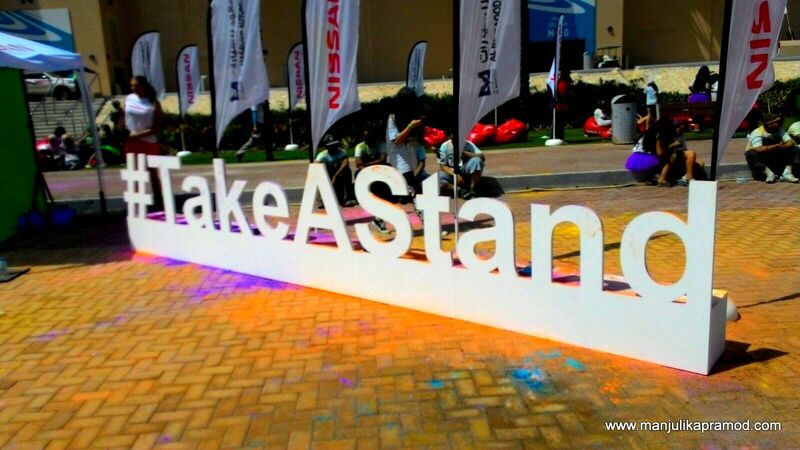 The intent behind the event makes it even more appealing.